In the 'Advanced connection settings' tab you can define a color that identifies this particular connection. 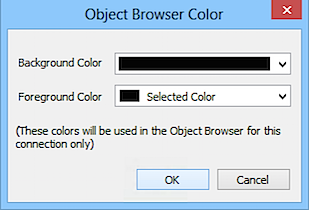 The color is used as background color in the Object Browser. Also, you can change from Object browser's context menu 'Change Object Browser Color'. 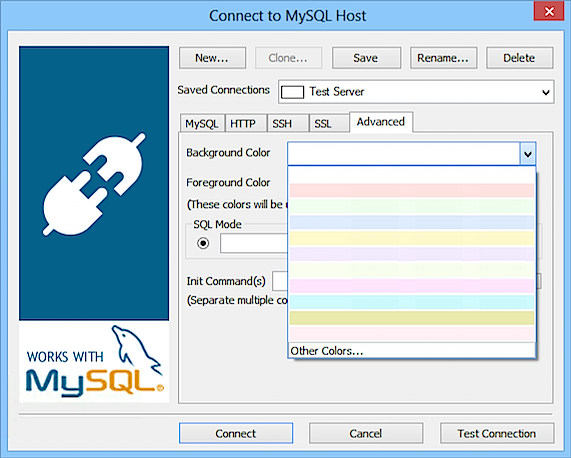 The connection manager has an option for the user to define a SQL_MODE for a connection. By default the mode is '' (empty mode). If the user wants an "empty SQL_MODE " for a connection he just leaves the SQL_MODE value blank. If he wants a specific mode he may enter a valid SQL_MODE string (not enclosed with in quotes). A combination of valid SQL_MODE string's need to be seperated by a comma. Also note that not all SQL_MODEs will work with SQLyog GUI. This includes all mode using " ansi_quotes" and the "no_backslash_escape" mode. If user wants to respect the global mode then the "Use global value" check box needs to be checked and the mode set for that particular server will apply for the SESSION. 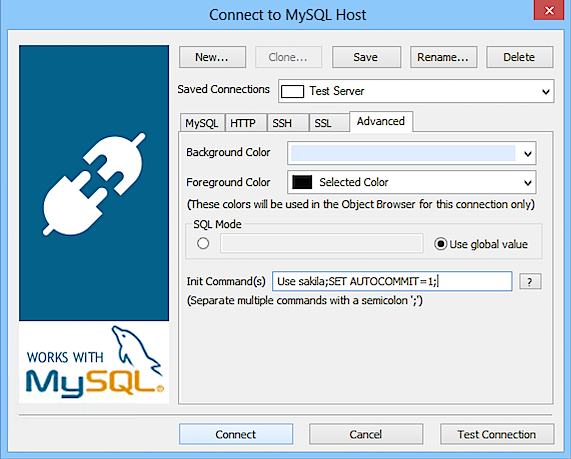 The SQL_MODE option is not supported in HTTP connection. The connection manager has an option for the user to define a MySQL init-command for a connection. This is an option (per connection) to define a query (or more queries) that will be sent when SQLyog connects (and reconnects). User can enter multiple valid command's saperated by a semicolon. It is not the purpose of this option to return data. If you specify a statement that does (a SELECT or SHOW statement), the data returned from the query will not be displayed. The reason is that INIT_COMMANDS are executed not only when SQLyog connects first time but also if it reconnects.